just ten minutes from Trondheim airport Værnes. Ersgard provides you with a different meeting experience, with room for conversations, inspiration and good breaks. The surroundings, the food and the hosts are the important pieces that create an informal atmosphere. we adapt both indoor and outdoor areas for your needs. / Coffee, tea, water, juice and fruit are available throughout the meeting. On arrival something sweet is served. The boardroom is the most used and versatile meeting room at Ersgard. The boardroom has direct access from the car park and its own conference hall with good-value group rooms. 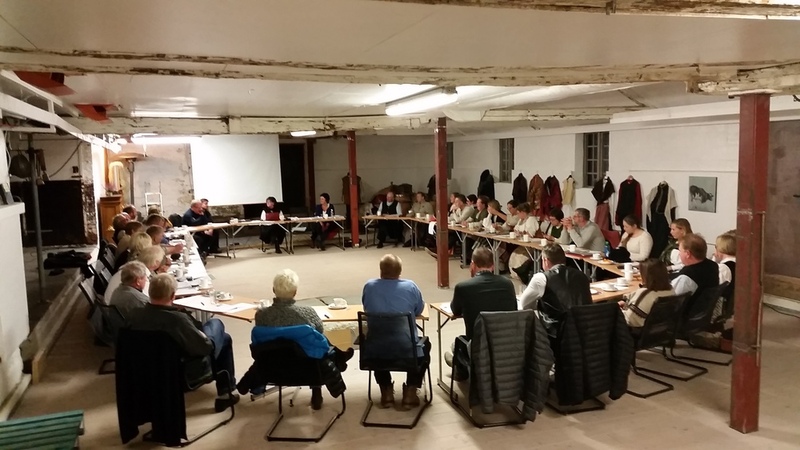 Originally, the room is the farm's manure storage, and in 2013 it was renovated to a modern meeting room with acoustics. The room is very suitable for board meetings, project meetings and workshops. But is also suitable for lectures and small conferences. The barn is the farm's largest room and perhaps the oldest. It has kept the original feel, but new solid wood floor was laid in 2015. The room is over 200 sqm, has very good acoustics and its own ambience. Large screen and audio equipment are installed in the room. The barn is very flexible as a meeting room, from creative workshops to a round table conference for 50 guests, r 120 guests seated in rows. The barn is also used for dinners, weddings, concerts, pub and market hall. Storstuggu is the farm's best preserved room, last time painted in the 1860s, we believe. Mainly used for all meals, but for lunch and evening meetings it is both informal and pleasant for meetings there. Storstuggu is on the 1st floor of the main lane with access to the farm square. The stables are Ersgard's smallest meeting room, but perhaps the room where the most important decisions are taken. Here executives meet, make agreements, and where well-known authors enjoyed a good dinner. Everything around the kitchen table. 1st floor in the Mastufløyen with exit to the farm square. The apartment is universally designed and suitable for everyone. Garden chairs, hammock chairs, stumps etc. At Ersgard we have more than enough cultural landscapes in which to meet. We recommend taking a hiking meeting down to the river or up at Spigiln. In the yard we have plenty of space and many seating areas. You can meet in the conference hall, in the yard or in the cabin by the river. We have room for meetings from 3 to 120 guests, we choose rooms according to their needs. All rooms have their own dishes for coffee and snacks. 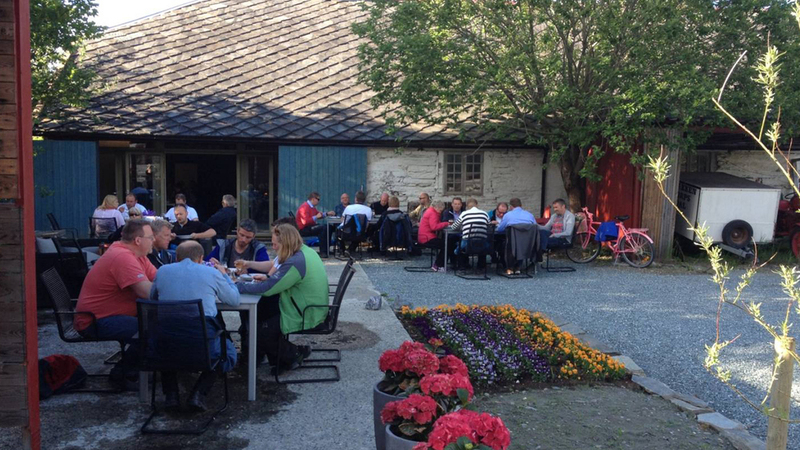 The lunch is almost always served in Storstuggu by the farm's cook. If you have time, we will gladly tell you about Ersgard's contentious history. All meeting rooms have all of the AV equipment integrated and wifi from fiber broadband. It includes projector, display and audio system. Ersgard offers accommodation with breakfast in a traditional and atmospheric setting. The farm hotel has accommodation for 20 people, divided into three apartments. If you are here with a group, two-day meeting, salmon fishing or the like, we will of course put together a package for you according to your needs. And you are always welcome to book a stay with us through Airbnb. Bathroom: Shared bathroom and toilet in the hallway. Living room: Communal living room with TV, sitting area, dining area and a kitchen. Kitchen: Electric kettle, microwave, fridge and some crockery. Here you will find classic B & B-style rooms, located on the 2nd floor. There are no right angles in the apartment. The rooms all have their own distinctive character and have changed little since they were built, in 1833. If you are lucky you will meet new friends in the common room at Storloftet. The room: Beds, towels and bathrobe. Kåret is located on the 1st floor of the trundle lane, completely renovated in 2013, and adapted to all. The apartment is a large suite and can also be used as an office, meeting place and workshop area for those who rent the apartment for two or more days. For an additional fee, pets may be brought. This is the apartment where the oldest generation in the farm has always lived. The accommodation was heavily upgraded in 2013 and is adapted to residents in wheelchairs. Rooms: Beds made, towels and bathrobe. Bathroom: The apartment has a shared bathroom and toilet for the 2nd floor. The apartment can be expanded by up to 4 beds by renting the family room in the Peterloftet, located on the same floor. Peterloftet is a large family room on the 2nd floor above the Kåret. It can be used as an additional room for the chosen 1st floor and Kårloftet on the 2nd floor. The room has two common beds and a sofa bed and TV. The rooms: Make up bed, towels and bathrobe. Bed has frame mattress of 90X200 cm. Kitchen and living room: Access to the fully equipped kitchen including dishwasher at Kårloftet. Etromshytte: With two beds without bed linen, kitchenette and seating area. Bathroom: Access to bathroom, toilet and simple kitchen in the barn. Wifi: None. Access to wifi and charging mobile phone on the farm. Simply furnished cottage with stone floor 100 meters from the farm. Former smithy, is used today as accommodation in the summer half of the year for pilgrims and others who wish to use their own sleeping bag. The cabin has no water or electricity. Equipped with oven, fireplace, kitchenette, sitting area and two beds. There is plenty of wood in the wood box. Dog can stay for free in the Smithy. The interior of the Smithy shows that salmon fishermen like to use the cabin as a heating room. Smithy is built together with the malt drier - Soinnhuset. The house is still used to dry and smoke malt. All serving must be pre-ordered and preferably more than a week ahead. Our farm wife stir the casseroles and is always smiling. She serves steaming hot meals to anyone who has meetings, lunches, dinners and to anyone who wants to celebrate their special anniversary with us. / Kjøtt i mørket av Sidet Trønderfe / Beef served in a rich gravy. / Byggrynskrem med bringebær fra Vikanlandet / Whipped cream with barley and raspberries. /Something to eat after midnight - soup, grilled sausage or something else you want. /Coffee after dinner with your own brought cakes. As traditional farm dinner we send the main course twice around the table, before dessert and coffee. Everyone eats the same dishes , but we customize the meals for each group. The St. Olavs path starts in Selånger outside Sundsvall and ends in the Nidaros cathedral in Trondheim. It follows the same road that king Olav Haraldson traveled when he returned from Novogorod in Russia in the summer of 1030 to christianize Norway and reclaim the norwegian throne. The 564 km long pilgrim path runs from coast to coast - through two countries - in the footsteps of St. Olav. At Ersgard we welcome hikers of all kind, both those who walk the St. Olavs path - inland or costal route, Norway across or those who want a base for Bird watching or other nature experiences in Skarvan and Roltdalen National park. You can come to Ersgard one by one or in a group. Cycling and riding pilgrims are also welcome. Til de som vil leve enkelt i en hytte som de deler med andre pilegrimer, de som ønsker å leie en egen leilighet til selvhushold og de som vil oppleve vårt flotte gårdshotell. På gården har alle tilgang til selvbetjent kjøkken, toalett, bad og wifi. Ønskes det servering av måltider eller transport av bagasje må disse tjenestene forhåndsbestilles, men betales direkte på gården. Vi ønsker at alle gjør en forespørsel eller forhåndsbooking senest kvelden før ankomst. Alle som kommer i en gruppe må kontakte hos eller en av våre samarbeidspartnere Nordic pilgrim, Aktivut eller Artic Wild Tours i god tid før ankomst. Vi skreddersyr besøke hos oss etter behov og ønsker fra gruppene og kan tilby fullpensjon med ekte bondekost og godt lokalt drikke. 4,5 km fra sentrum av byen Stjørdal med alt av butikker og 6 km fra Trondheim Lufthavn Værnes. Det passer fint å overnatte på Ersgard ved ankomst og adgang Trondheim Lufthavn Værnes. St: Olavsleden er fremdeles en led du kan gå i fred og ro, som oftest alene. Men spesielt i dagene før og under Olsokdagene på Stiklestad og Olavsfestdagene i Trondheim, er det mange vandrer på gården vår samtidig.